The bad news about toxic children’s products never ceases. Recently, I learned that food packaging, such as used for candy and pizza, contains toxic perfluorinated chemicals (PFCs), specifically perfluorooctane sulfonate (PFOS) and perfluoroctanoic acid (PFOA). As a general rule of thumb, if I can’t pronounce, I don’t want my kids exposed to it! Thankfully, neither does the California legislature. PFCs are man made chemicals used for decades to make products that resist heat, oil, stains, grease and water. They are commonly used in nonstick cookware, stain-resistant carpets and fabrics, and food packaging. PFCs are found in packaging for fast-food sandwiches, french fries, pizza, baked goods, beverages, and candy to prevent staining and grease spots. There is evidence that these dangerous chemicals migrate to food from the packaging, especially when heated. According to the Environmental Working Group, PFCs are found in over 98% of American’s blood! PFCs persist in the environment forever; there is no getting rid of these chemicals. They are suspected to be carcinogens and have induced breast tumors in laboratory animals. PFCs have also been linked to pregnancy complications. Studies indicate that PFOA specifically can cause developmental effects in laboratory animals, and the data is growing about PFCs ability to migrate from packaging to food, especially when heated. Defines perfluorinated compounds, food contact substances, hazard traits and related terms for purposes of the new chapter. Prohibits, on or after January 1, 2010, the manufacture, sale, or distribution in commerce of any food contact substance that contains perfluorinated compounds, in any concentration exceeding 10 parts per billion (ppb). Prohibits manufacturers from replacing perfluorinated compounds with carcinogens rated by the United States Environmental Protection Agency (US EPA) as A, B, or C carcinogens, or substances listed as known or likely carcinogens, known to be human carcinogens, likely to be human carcinogens, or suggestive of being human carcinogens, as described in the “List of Chemicals Evaluated for Carcinogenic Potential,” or known to the state to cause cancer as listed in the California Safe Drinking Water Act (Chapter 4 (commencing with Section 116270) of Part 12). Prohibits manufacturers from replacing perfluorochemicals with reproductive toxicants that cause birth defects, reproductive harm, or developmental harm as identified by the US EPA or listed in the California Safe Drinking Water Act (Chapter 4 (commencing with Section 116270) of Part 12). States that manufacturers shall use alternatives that demonstrate the fewest hazard traits when replacing perfluorinated in accordance with this bill’s provisions. I am thankful to live in the state of California and hope this bill passes. SB 1313 is being sponsored by Environmental Working Group and has been endorsed by the Sierra Club, Environment California, the United Steelworkers and California Labor Federation. 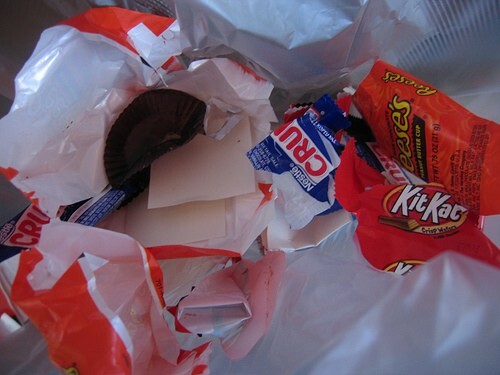 Since I don’t allow my children to eat candy, other than organic chocolate, or fast food, I think that we have been mostly protected from food wrapper PFC contamination; however, it is impossible to fully protects one’s family from a pervasive toxic chemical. The Environmental Working Group study detected the PFCs in the umbilical cord blood of 10 of 10 newborn babies. If newborn babies aren’t safe, none of us are. « Swimming Pools, Chlorine and Asthma – What’s The Connection? So Jennifer, I am curious as to what you are doing to protect your home environment including your family, from caustic dangers of cleaning products, daily care items, etc. Sherry, I pretty much use Ecover dish soap and vinegar for all my cleaning needs. I do use a natural oil based cleaner on the hardwood floors. I also use vinegar for killing weeds in the walkway. We use all natural beauty items too (CA baby for the kids, Dr. Hauschka for me). I also use Ecover laundry soap, and I often throw this powder in the toilet with vinegar for cleaning. Let me know if you have any specific questions.